Home » california shark diving » Deep Blue Munches on Dead Sperm Whale in Hawaii Today! Deep Blue, Famously Huge Great White Shark, in Hawaii Today! In 2013 America’s Shark Boat first encountered and named Deep Blue the largest recorded live white shark in the Pacific at Guadalupe island with a team from Discovery Channel’s Shark Week. She was sighted again in 2017. Now a decaying sperm whale carcass that has been floating in Hawaiian waters since Thursday is drawing in schools of hungry tiger sharks and one VERY special visitor … Deep Blue! On Sunday, sport divers spotted a famously huge great white shark named Deep Blue feeding on the whale near Oahu. The rare sighting was reported by HawaiiNewsNow based on footage shot by local divers. In another Facebook post, fellow diver Mark Mohler said at least three great whites were visible, and that Deep Blue could only be seen on Sunday. Deep Blue became an icon several years ago during Shark Week on the Discovery Channel, though her remarkable size and age—roughly 20 feet long and 50 years old, according to many media reports—are up not up for debate. She is huge! Her sensational reputation as the “biggest” shark on record can be attributed to America’s Shark Boat at Guadalupe in 2013, and a 2014 Shark Week episode (shot in 2013) in which Mauricio Hoyos Padilla, director of the shark nonprofit Pelagios-Kakunjá, and others filmed the large female near Mexico’s Guadalupe Island. Book Today With America’s Shark Boat and SAVE! 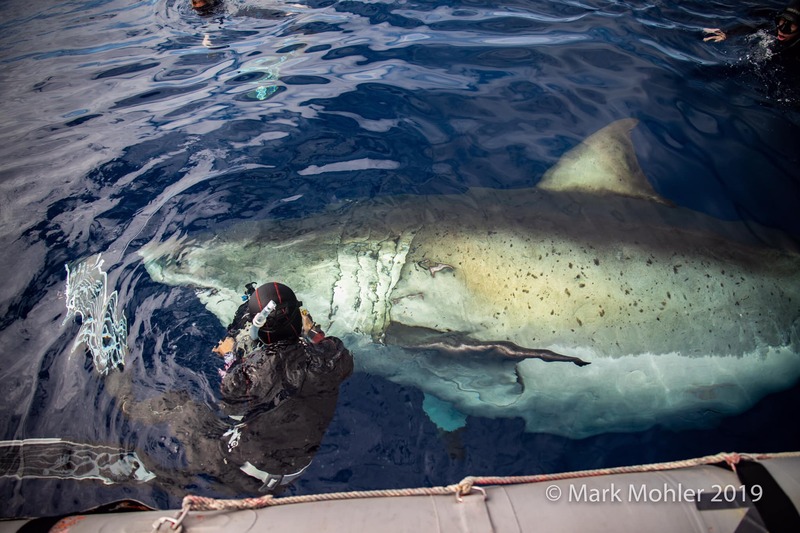 For just $500 down you could be on your way to cage diving with great white sharks this year. We know you have a choice of liveaboard shark diving vessels for Guadalupe Island this year. Since 2000 we have watched the liveaboard shark fleet grow, and grow, and grow. Safety and shark diving value is a primary concern for us and we have the best safety record in the shark diving fleet. Not only is our U.S. crew the most experienced dive operator at Guadalupe Island (18 years and counting), but they are all federally licensed and participate in the U.S. Coast Guard’s random drug testing program. Over the many years we have been cage diving at Guadalupe island we have remained the value shark boat. Offering shark cage diving for less, and the place shark divers call home with a return rate that is the envy of the fleet. We love our shark divers and they love us. Make this the year you do something incredible on your next shark vacation. The year you get to experience cage diving with great white sharks at the most amazing shark location in the world. We’ll price price match and beat ANY comparable vessel offer you see online. You don’t need ‘mints on your pillow’ to cage dive with great white sharks at Guadalupe Island. You just need great food and accommodations, a seasoned shark diving staff, lots of great white sharks, savings over everyone else, and the vessel that started it all – America’s Shark Boat. We’ll be waiting for you. Let’s go shark diving!